A dragline excavator is a piece of heavy equipment used in civil engineering and surface mining. Dragline fall into two board categories: those that are based on standard, lifting cranes, and the heavy units which have to be built on-site. Most crawlers cranes, with an added winch drum on the front, can act as a dragline. This units are designed to be dismantled and transported over the road on flatbed trailers. The much larger type which is on site is commonly used in strip-mining operations to remove overburden above coal and more recently for oil sands mining. 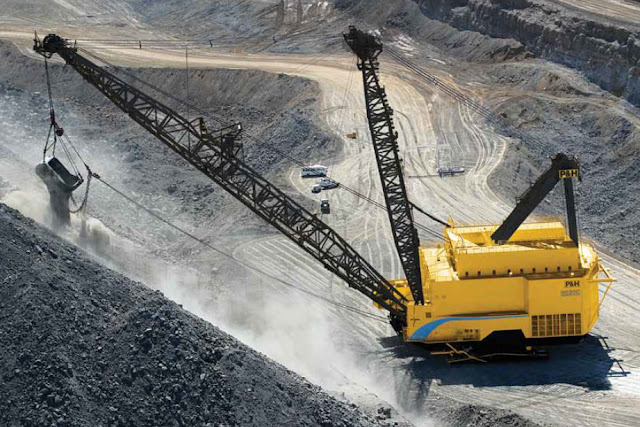 The largest heavy draglines are among the largest mobile land machines ever built. The smallest and most common of the heavy type weigh around 8,000 tons while the largest built weighed around 13,000 tons. 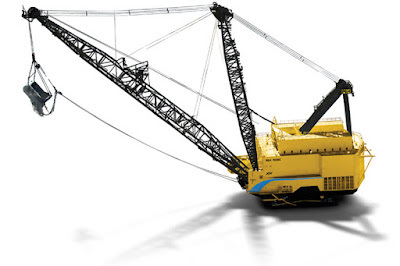 A dragline bucket system consist of a large bucket which is suspended from a boom with wire ropes. The bucket is maneuvered by means of a no. of ropes and chains. The hoist rope powered by large diesel or electric motor, supports the bucket and hoist-coupler assembly from the boom. The drag rope is used to draw the bucket assembly horizontally. 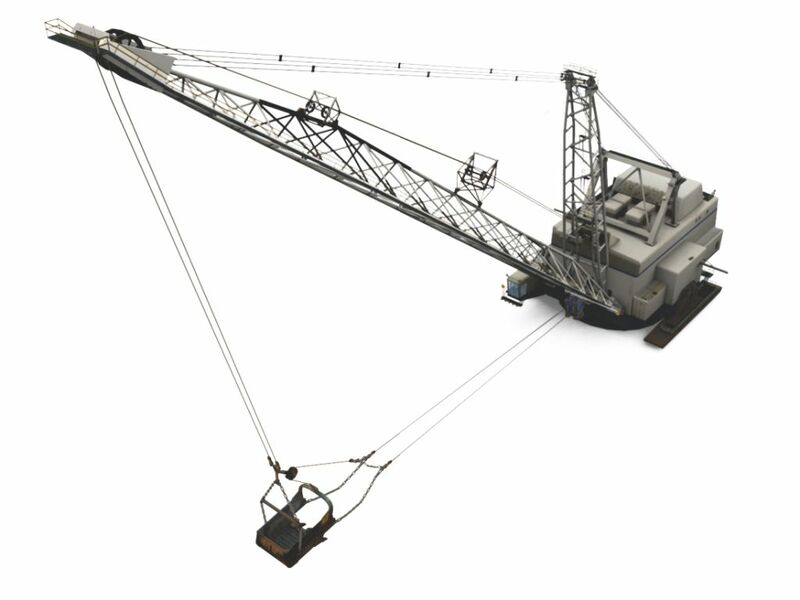 A schematic of a large dragline bucket system is shown below. Systematic diagram of a Dragline. The primary limitations of draglines are their boom height and boom length, which limits where the dragline can dump the waste material. Another primary limitation is their dig deph, which is limited by the length of rope the dragline can utilize. 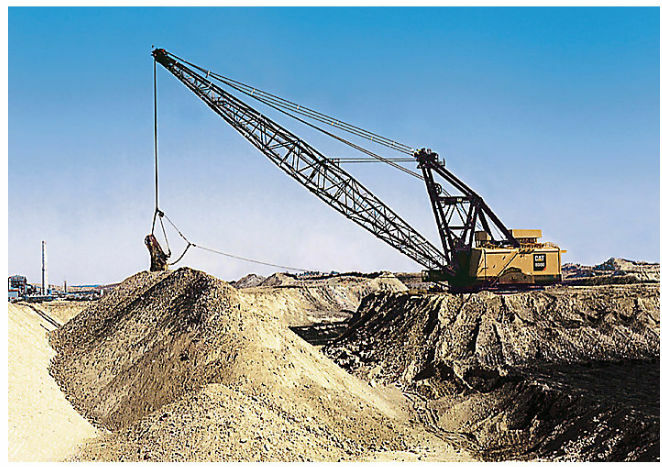 Inherent with their construction, a dragline is most efficient excavating material below the level of their base. While a dragline can dig above itself, it does so inefficiently and is not suitable to load piled up materials (as a rope shovel or wheel loader can). Despite their limitations, and their extremely high capital cost, draglines remain popular with many mines, due to their reliability and extremely low waste removal cost.